As in neither offers a direct competitor. Although the first generation wasn’t anything all that special, today’s GMC Canyon has proven itself to be not only a fantastic mid-size pickup truck, but also the right truck for the times. 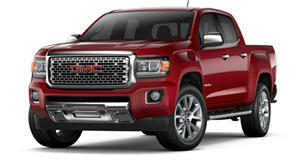 The second generation GMC Canyon, and its corporate twin, the Chevrolet Colorado, went on sale for 2014 and quickly proved that not all American truck buyers wanted or needed full-size offerings. In other words, Ford realized it made a mid-size truck miscalculation when it didn’t replace the Ranger, figuring those owners would be fine with the larger F-150. Combined with dropping gas prices and the fact that it’ll easily fit in most garages, the GMC Canyon is more than just a great truck; it’s also a wonderful daily driver with the right packaging. We tested a mid-range 2017 Canyon 4WD SLE Crew Cab Short Box and, like the Colorado, it provides the ideal blend of work truck and premium features. We especially like its optional 3.6-liter V6 with 308 hp and 275 lb-ft of torque. But we suspect a good chunk of Canyon buyers are going to be interested in the newly optional 2.8-liter Duramax turbo diesel with 181 hp and 369 lb-ft of twist. One downside: the oil burner is a $4,500 option over the V6. Step inside and you’ll find everything you’ll need in a modern vehicle. An 8-inch color touchscreen adorns the center of the dash and the inclusion of Apple CarPlay compatibility, 4 USB ports, and a 4G LTE WiFi hotspot is very much appreciated. All in all, our 2017 GMC Canyon, a total of $39,055, is the premium mid-size pickup truck that Ford and Ram desperately need but don't have right now. Special thanks to Woodland Motors for letting us film the car.